Mexico has been the source of a multitude of foods to the world that nourish both mind and body; among these are the flamboyant chilis, the multi-tasking avocado (aguacatl), the brain-stimulating chocolate (xocoatl), and the mood-boosting sensual vanilla (tlilxochitl). However, the humble vegetable pear known as chayote holds a mission for our palate that we should explore. Chayote is a member of the Cucurbitaceae, or squash family, but unlike other types of squash, it has one single large seed in the center of the fruit. Its Latin name is Sechium edule and is also called mirliton, choco, or in Nahua, chayohtli. Each fruit has its own unique contours and wrinkles. Some varieties have prickly thorns on the outside of the skin and must be handled carefully with gloves. Being a healthy carbohydrate, it’s a good source of Folate and Vitamin C and amino acids which are the building blocks of protein and therefore numerous brain chemicals. Traditional medicine in Mexico uses the chayote plant to dissolve kidney stones by drinking a tea of the leaves. It’s diuretic properties also are used to reduce hypertension. 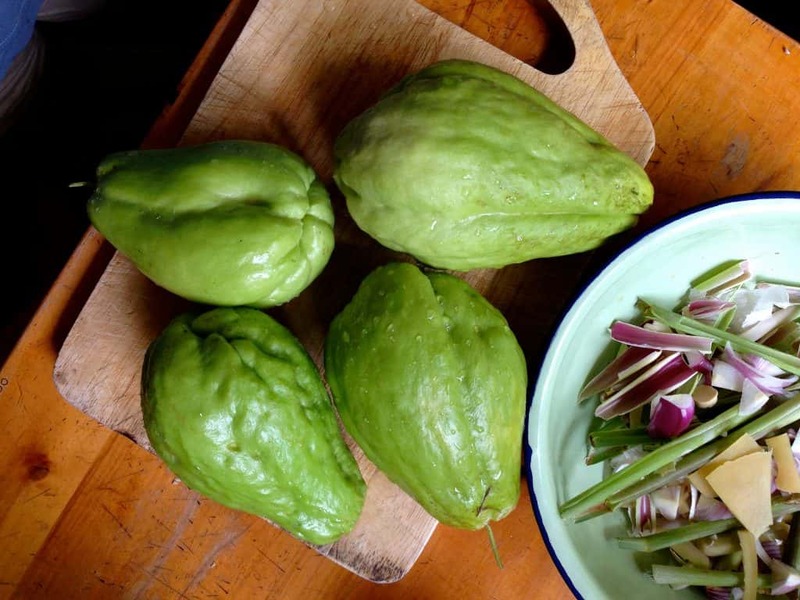 The chayote is eaten raw or gently cooked and its mild flavor benefits from potent seasoning. Adding other foods to a chayote recipe brings out the best potential. Below is one of my favorite ways to prepare chayote; it is best to peel it under cold running water as it has a sticky fluid that can temporally anesthetize your skin. Peel it as you would a cucumber and then slice in half, removing the inner seed and then slice and cut into 1-inch cubes and set aside in a bowl while you prepare the remainder of the dish. Peel the chayote. Remove the seed and chop into 1″ pieces. Chop the onion into 3/4″ pieces. Heat up the oil gently and add the garlic, onion, and half a serrano chili (de-seeded). Let cook for a few minutes and then add the raisins, chayote and white wine. Cover and simmer on a low light for 15 minutes. The chayote should be firm and crunchy, but tender when ready. While the chayote is simmering toast the pine nuts (or pumpkin seeds) until brown. For the last few minutes uncover the chayote so the wine cooks down. Add salt and pepper. Place the chayote into a serving bowl and top with the nuts. It makes a great meal in itself of a side to a protein dish, or a topper for rice with a side of Oaxaca string cheese. How to get chili oil off your skin? Don’t wash! My friend Alicia taught me this old trick to avoid the after-effects of chili oil on your hands that can in turn sting your eyes. After handling the chili do not wash your hands. It will only spread the oil. Instead rub your hands through your hair (if bald, find someone else’s hair!) the hair will absorb the oil perfectly. Then you may wash with soap and water.